A police officer leads two women and a child from Sandy Hook Elementary School in Newtown, Conn., where Adam Lanza (inset) opened fire, killing 26 people, including 20 children. 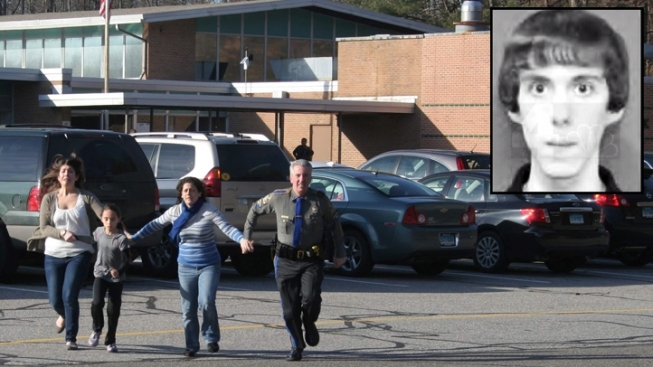 (Photo by Newtown Bee; inset photo of Lanza provided to NBC by government officials). Connecticut lawmakers are reviewing mental health care following the Newtown school shooting, even though they and the public have little insight into what might have been ailing the 20-year-old gunman. A prosecutor said he cannot release any information about Adam Lanza's mental health because of state conduct rules for attorneys. A legislative panel on Tuesday took testimony on potential changes to the state's mental health system. State Rep. DebraLee Hovey said she and others who represent Newtown are "nervous about different conversations occurring without all of the information." But she says it's never too soon to analyze the system.